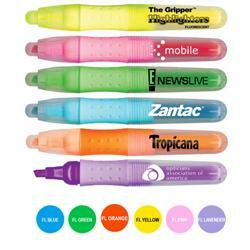 The Gripper custom fluorescent highlighter with your promotional logo. 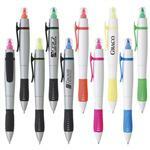 This comfortable to hold, easy to control highlighter will provide the needed confidence to accent any project. The bright, fluorescent inks have transparent, read through color and are bold enough to highlight important text. Comfortable rubberized grip. Non-Toxic. Available Colors: Fluorescent Yellow, Fluorescent Blue, Fluorescent Green, Fluorescent Pink, Fluorescent Lavender, and Fluorescent Orange. Typical Imprint Area(s): 1.75" X1.5"
Non-Toxic, Rubber Grip, Fluorescent Ink, Awareness Pink Available. Bulk, 300 @ 11 Lbs.